I distinctly remember the first time that I heard Cecil Forsyth’s Viola Concerto in G Minor. It was the summer of 1989, and I was spending some free time while at the Interlochen Arts Camp doing what I love: seeking out viola music. I had located a recording of violist Patricia McCarty playing the concerto’s first movement with the Interlochen orchestra from years earlier and was immediately hooked. Wow! 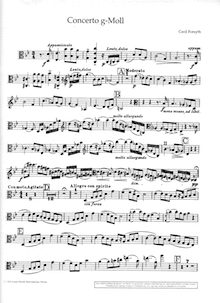 What a piece: it had bravura (including a flashy cadenza), big orchestral tuttis, and lyrical melodies; everything that the teenage me enjoyed in the great Romantic violin concertos, but suddenly here in a viola concerto. Why had I never heard of this piece before? • It is a rare example of a late Romantic-period viola concerto: While the concerto was written in 1903, its musical style is firmly rooted in the Romantic tradition, similar in style to the works of Camille Saint-Saëns or Édouard Lalo. • It is viola-friendly: Forsyth was a violist himself, so the concerto is idiomatic and shows the viola off to great effect. Forsyth was also well-regarded as an orchestrator, and the orchestration is nicely balanced so that the audience can hear the viola. • It is audience-friendly: Speaking of the audience, many viola concertos can be challenging for an audience. The qualities mentioned above that attracted me (bravura writing, lyrical melodies, and big orchestral tuttis) also appeal to many concert-goers. • It is a nice transition from standard Classical concertos to standard twentieth-century concertos: Moving from concertos by Hoffmeister or Stamitz to concertos by Hindemith, Walton, or Bartók can present a challenge to violists, both technically and musically. Forsyth’s concerto nicely bridges those challenges and also makes a nice chance of pace stylistically from other standard concerto repertoire. • It holds up well in competitions against other string concertos: Violists, particularly high-school violists, are often at a disadvantage when competing in concerto competitions; what viola concertos can compete against Dvorák’s Cello Concerto or Mendelssohn’s Violin Concerto? Forsyth’s concerto, especially the first movement, really packs a punch, notably with its introductory section and the extensive cadenza before the recapitulation. Played well, it can really impress judges, while conductors appreciate that the orchestra part is more manageable than other viola concertos from the twentieth-century. Numerous violists in recent years have successfully won competitions playing Forsyth’s concerto. But the biggest reason to take a look is simple: Forsyth’s Viola Concerto is a wonderful piece of music that you will enjoy playing. Welcome, David, author of at least two articles on Forsyth in 2008 (http://en.wikipedia.org/wiki/Cecil_Forsyth)! I haven't been able to source them, and I wonder whether you would attribute Forsyth's neglect, at least partially, to his emigration to the USA in 1914 when fellow Brits were enlisting in the armed forces? I don't imagine it would have made him popular with British performers and audiences. A pity, because the music is worth hearing and playing. Yes, I do attribute his neglect partially to his leaving England; more because he was no longer there to promote his music or obtain performances through his friends and colleagues than from any backlash over his lack of participation in the Great War. Once in the USA, he was fairly successful in obtaining performances for new works, mostly vocal music, including works for glee clubs, which have also not received much attention since his death.